In architecture, they say form follows function. When it comes to good food, the new axiom is that function follows food. 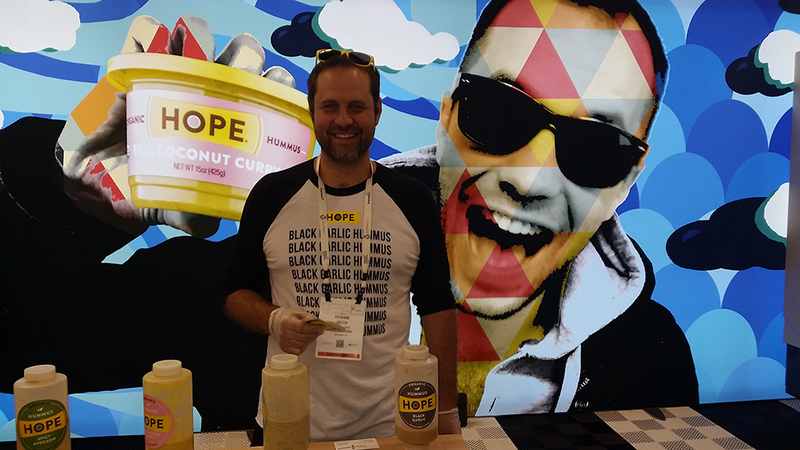 This year, an estimated 83,000 to 85,000 people attended the 37th Annual Expo West in Anaheim, CA, recently (3/8 to 3/12) to view more than 3,100 exhibitors’ new product offerings, most of which promise a lot more than a tasty snack, meal, or drink. I have been attending this show regularly for over 20 years. For the past several years, the Broadthink team has attended for our client, FoodTrients, a brand dedicated to the nutrients that help us age better. Even though our feet hurt and we are exhausted after 3 days at the show, we love meeting so many creative new business owners, and ferreting out the latest trends that are coming to grocery shelves near you. This year’s show did not disappoint. Functional foods (and drinks) are the name of the game. A chip is no longer just a chip. It may be infused with protein, ancient grains, healing herbs, probiotics and a few superfoods, and it may not even be chip-like. Two of my favorite new offerings are Burma Love’s Lotus Chips and Jicachips’ jicama chips. There are delicious potato chips from Vegan Rob’s flavored with wild mushrooms and their Brussels sprouts puffs, and delicious sauces and soups from Le Grand made of organic superfoods such as kale, spinach and broccoli that are vegan, sugar-free, gluten-free and sulfite-free. Protein-packed chickpeas were everywhere, too – in chips, dips, crackers, frozen entrees and more. Hippeas are one of the fun snacks we liked, and there are a number of roasted snacks in various flavors from companies such as Biena Foods. A company called Banza makes chickpea flour into high protein, high fiber dried pasta in shapes from angel hair to ziti. The samples they handed out were perfectly al dente. Vana Life Foods presented a hearty, shelf-stable, microwavable entree containing green chickpeas with sweet potato in a coconut/lime/cilantro sauce as part of their Legume Bowls products. It was tasty! And while many of the new drinks on the market will quench your thirst, they are also determined to help you thrive. There were lots of ginger, vinegar, kombucha, probiotic, and fermented tonics to try. There are also coffees, teas and juices that contain vitamins, herbs, probiotics and more. Just about every brand seems to be spicing up their products, too. We found chili lime, habanero, spicy ginger, Sriracha, and cayenne in chips, crackers, frozen dinners, and drinks. As the American melting pot grows, our interest in more exotic, international flavors expands. A plethora of international dishes in the convenience category are contributing to America’s hunger for more flavorful foods. And water products continue to grow with new functional varieties -- pre- and probiotics, alkaline balancers, minerals, fruit and herbal flavors. There were even a couple of black waters that are supposed to supply more essential minerals and benefits. Even popsicles got into the act, many with less sugar and more fresh ingredients. Eatpops has a more adult line of popsicles with benefits – Green Detox (kale, spinach, apple, pineapple, lemon, ginger, cayenne); Cleanse (lemon, cayenne, agave); Super Detox (acai, noni, goji, cherry); Restore (kale, banana, pineapple, pear); and more. § We stopped by the Sunflower Meadows Herb Farm booth and met experienced herbalist Doug Taylor who scans the iris of your eye to determine your body’s needs and deficiencies, and then recommends a regimen of herbs to correct the conditions. We all tried it and found it fascinating! I will let you know how my personalized herbal formula works. If I look years younger, you’ll know why. · Transparency – Shoppers want to know that a company has nothing to hide. · Verification – Certifications from the right organizations do matter (GMO Free, Certified Organic, Gluten Free, Dairy Free, Fair Trade, and others). · Millennial Trust – This new and powerful generation of consumers is putting nutrition first as part of their strategy to stay healthy. · Climate of Change – Whether food is the victim, villain, or solution to environmental issues, consumers care more and more about how products impact the earth. · Plant Revolution – Whether you’re focused on heart health, climate health, ecology, or animal welfare, plants are center-stage as man’s best friend. · Feed Me – There are more people vying for less land and water, which calls for a great deal of innovation (grow your own, green-walled buildings, water conservation practices, etc.). · Regeneration – Doing no harm is required, but healing existing harm is a great opportunity to build loyalty and trust. · Prioritizing Health -- Wellness is about more than prevention these days. It’s about optimizing health as brands develop products that can help consumers thrive rather than just survive. · Stress & Sleep Solutions – Whether we need to power up, power down or find balance throughout the day, companies are looking for ways to help – aromatherapy, new marijuana and hemp products, and supplements like magnesium, an essential mineral that most people are deficient in. · Sugar Vilified – Sugar is the Most Wanted villain in food and drink products. Consumers are demanding safer, healthier sugar substitutes, and less or no sugar in products sweetened with sugar. Monkfruit sweeteners (natural & calorie-free) and some new Erythritol blends are some of the fresh alternatives to look for. · Food Allergy Friendly – Allergies are at epidemic rates in the U.S. and our overly-processed-food diets don’t help. Food companies have expanded offerings for special diets with an increasing number of GMO Free, Gluten-Free, Dairy Free, wheat free, and/or peanut free foods. Dairy products and baked goods are using chickpeas, nuts, and vegetables as substitutes in many new products. · Consciousness Rising – As consumers look beyond products to the companies behind them, companies are faced with a new bottom line: purpose. · The Purposeful Brand – Aligning with a social or environmental cause is the new norm. Businesses can be a force for good, and consumers put more faith in those that are doing good. · Waste Not, Want Not – Our landfills are flooded with wasted food, while many go hungry. Companies that develop innovative solutions to reducing waste and to feeding those in need will stand out and be rewarded. The demand for innovative, earth-friendly packaging is also critical and growing among consumers. Now more than ever, consumers want brands they can trust and believe in, and the challenge is on for food companies to deliver. This is no easy task, but the Natural Products Expo gives me hope that more and more companies will rise to that challenge.